As part of continuing efforts to combat Ebola in Liberia, the international medical humanitarian organisation, Médecins Sans Frontières/Doctors without Borders (MSF) has set up a 10-bed Ebola Transit Unit near Redemption Hospital in the densely populated slum community of New Kru Town on the outskirts of Monrovia. The Liberian healthcare system has been severely tested by the Ebola epidemic: many hospitals and clinics are now closed, and those still running are turning feverish or vomiting patients away, for fear of being infected by the virus. Redemption Hospital is a 200-bed public health facility. It was closed for regular service and was turned into a holding centre for Ebola patients at the height of the crisis in August 2014. As the only facility offering free medical care for a catchment area of 90,000 people in Monrovia, this was a severe blow to the city’s inhabitants – especially to those not able to afford private healthcare. Many patients and health workers have died since the Ebola outbreak and the hospital was shut down entirely in October. Although the out-patient department (OPD) has reopened to treat people with less critical conditions, the hospital remains closed to the public for all other services. 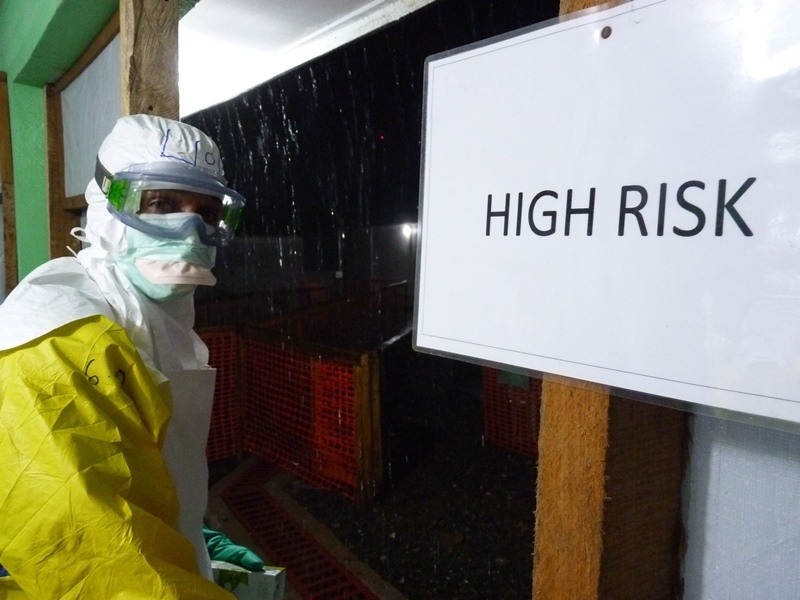 Since mid-November, MSF is aiming to isolate as many Ebola patients as possible from New Kru Town. We are aiming to do this by supporting the triage at the hospital’s OPD and by running the Transit Unit that allows for quick isolation, diagnosis and referral to an Ebola Management Centre (EMC) for Ebola suspects if needed. This should help the hospital to return to its role as a secondary healthcare provider in due course. All equipment that has been used inside the Transit unit is carefully washed with chlorine. Whoever comes to the hospital’s OPD or directly to the Transit Unit, has to go through a screening process, where specially trained nurses check for Ebola symptoms and decide whether or not the patient can go for a normal consultation or needs to be admitted to the 10-bed unit. At the Transit Unit, MSF nurses take a blood sample of the suspected patients, who are placed in an individual room where they receive standard medication, food and drinks while waiting for their results. If the test comes back positive for Ebola, MSF will arrange for a quick patient transfer to an EMC for further care. “We believe that infection control measures and triage points should be implemented urgently within regular health facilities. Not only to reduce the spread of Ebola, but also to stop people dying from preventable diseases and unmanaged complications,” says Stein. Authorities at the hospital are enthusiastic about the Transit Unit but much remains to be done to make the hospital fully operational again. Part of the task at hand is to disinfect the hospital’s entire in-patient area. 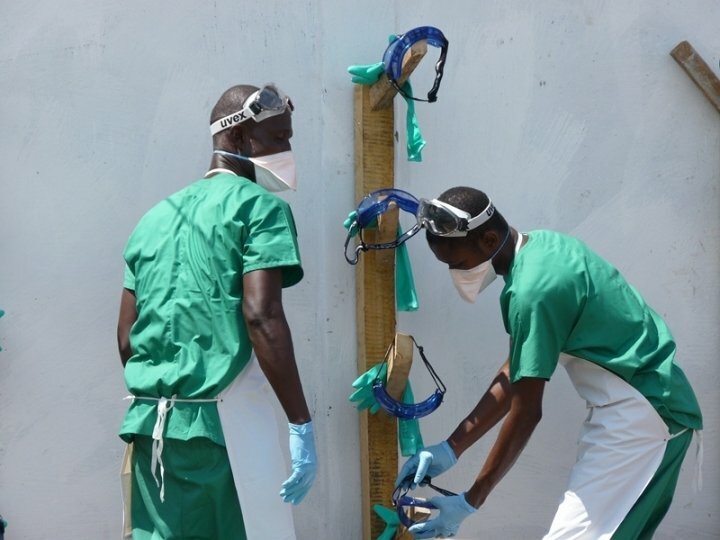 This is an immense undertaking for which, thankfully, the International Committee of the Red Cross (ICRC) has stepped in and is currently working non-stop to ensure an Ebola-free environment inside the hospital building. Patient and relative with HP: A suspected patient who tested negative for Ebola meets the health promotion team together with one of his relatives before leaving the transit unit. This is important in order for the team to be able to follow up the reintegration of the person at home and in his community. MSF Transit Unit at Redemption Hospital, Monrovia/Liberia. As community involvement and understanding is a key aspect in the Ebola response, MSF has been organising visits for community leaders from the greater Monserrado County, in which Monrovia is located, since the opening of the Transit Unit in November. They are shown the structure’s low risk zone and receive information about the set-up, in order to raise awareness about the unit and its significance in helping the community to combat the virus. Visits like these help to demystify Ebola-related facilities and to show key community influencers, such as zone chairmen, religious leaders or heads of community-based organizations, what is happening inside the closed off areas and to prevent rumours and misperceptions. For the same reason, the Transit Unit is also open to the families of suspected patients. In a specific area, they can see and talk to their relatives inside the isolation part. Health promotion and psychosocial teams are there to support both patients and family members. “People need to understand what is going on, from their admission to the Transit Unit to their potential transfer to an Ebola Management Centre, all the way to their discharge," explains Stein.